WPMu at a campus near you? WordPress Multi-User as an educational publishing platform…who knew? You, that’s who! The Blogs@Baruch publishing platform, powered by the ever venerable WordPress Multi-User, is ready for official promotion, so given my status as fanboy, consider it promoted. Mikhail Gershovich has worked long and hard over the last year and a half on this project, and if you know anything about the unbelievable challenges a university system the size of CUNY presents to all things IT, I have to say that this is a herculean task that I find truly remarkable. I am falling ever deeper in love with Mary Washington, but CUNY will always have a place in my heart, and to see it clothed in the most attractive publishing threads out there (thanks to Mikhail) makes me both thrilled and nostalgic. Speaking of attractive, be sure to check out the way they have designed the main page, under the design prowess of the mighty Luke Waltzer, whose ability to re-imagine WordPress has been consistently impressive over the last two years. In fact, Luke and I started as Instructional Technology Fellows at the CUNY Honors College several years ago, and while he may be far quieter than me when working with faculty (in no small part because he is soon to be completing his PH.D.), his work is extremely impressive and well worth marveling over. 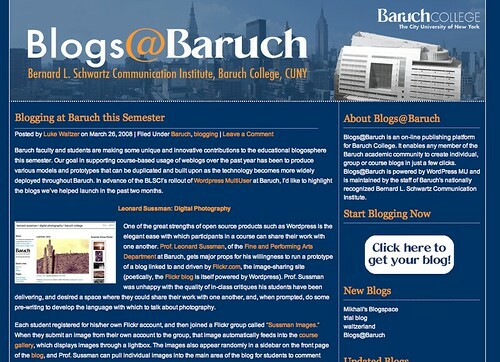 Be sure to visit Blogs@Baruch and check out some of the projects they are working on using WordPress, amazing stuff. In addition to Baruch, I recently came across another University using WPMu thanks to this very kind and encouraging comment from Michelle Boster at Suffolk University. 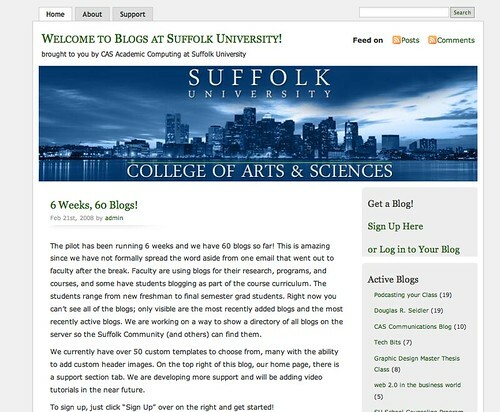 They recently rolled out Blogs at Suffolk University very quietly as a pilot, and made little, if any, fanfare about it. Nonetheless, within 6 weeks their blogging system had 60 blogs, and that is simply the beginning. They are using the ever classic MistyLook, and I have to echo Martha once again —when are we going to start pooling our resources and helping one another bring the truth to the educational masses? Good for Suffolk University for taking the “leap of faith,” and reaching out to other universities who are doing similar things. I really hope they raid, pillage, and steal the documentation we wrote, for there is no reason to re-write this stuff –I think I have to find my Creative Commons tag for the UMW Blogs Support Wiki so that everyone knows they are free to borrow, remix, and rework as necessary. This entry was posted in experimenting, WordPress, wordpress multi-user, wpmu and tagged baruch college, cuny, publishing platform, universities, wpmu, wpmued. Bookmark the permalink. 6 Responses to WPMu at a campus near you? Wow! I was just reading the Bava and stumbled on our featured snapshot. Cool! I would love to start pooling resources (and ideas) with others and have been thinking about that for quite some time. Finding a central space to connect would be great. Any ideas? Thanks for the offer on the documentation! We have very little created so far for as this has taken on a life of its own very quickly… I’m sure you know all about that. There is now a committee forming to move it from pilot to official as soon as possible — exciting! At the same time we started this, we also started our own iTunes University site, still in pilot as well (I know, a bit crazy). I’d be more than happy to share resources on that, too, if UMW ever goes in that direction. I have a bit more documentation on that since its more complex than WordPress, including a blog dedicated just to podcasting. Thank you, Jim, for your kind words re: what we’ve been able to do at Baruch. Quite literally, we couldn’t have done it without you. Let me get in the long line of folks who have looked to your work w/ UMW Blogs for inspiration. We have learned much from you, Rev. We have much work to do to get our faculty and students as excited about Blogs@baruch as we are. The winds of change are blowing across CUNY and I bet that we are only the first ones to go in this direction. Thanks for the props, Jim. If that is what you guys are arguing, then things seem just as good up at the BLSCI as they are here at UMW. Good for you two, this is the beginning of an awesome project. And if Mikhail is right, and more of CUNY catches on, then you two may have spearheaded brining one of the world’s most diverse (and I mean diverse here in all sorts of ways) educational community online. Now that’s something. 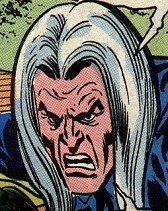 Of course I am up for a collaborative space. I have a new plugin that should go live Monday that might just do the trick (I’ve just been waiting for it to be tested a bit more).